We chat with indie jazz pop band Picnic, who are poised to release their debut EP, Four Ways To Cure Teen Angst, this month. 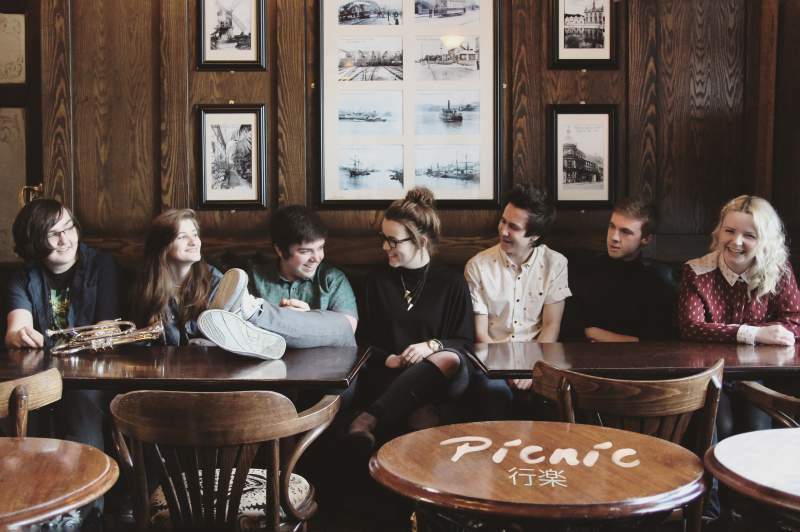 We are Picnic, we’re a seven-piece indie jazz pop band from Sunderland. We were terrible at everything else! The majority of us are currently studying music at either college or university, so it’s a huge part of our lives that we’ve dedicated a lot of time to. We’re huge music nerds I suppose! Musically, our list of influences are endless, although there probably are some more obvious ones that people have picked up on. There’s an instrumental band called Clever Girl (who I really encourage you to check out!) that really inspired us to write this type of music, I’d say they are up there with Jamiroquai as our biggest influence musically. Other than that there’s shades of indie pop like Bombay Bicycle Club and Little Comets, right up to more obscure math rock and jazz artists like Toe and Charlie Christian. Lyrically, songwriters like Brian Sella (of The Front Bottoms) and Randy Newman are probably our favourites. Happy indie jazzy dancey pop music! We were also recently called ‘summer indie’, which I think has a nice ring to it. We don’t fit into the local music scene at all, haha! Our objective was to do something completely different, and it’s somewhat of a gift and a curse that we’ve achieved that. Seven nerdy teens/twenty somethings playing jazz chords and singing happy melody lines just do not fit in with the current local scene. We are fans of a lot of the bands still coming out of the North East, but playing shows with them often leads to a very confused audience! We put a lot of effort into sounding tight and polished at a live show, we also put in a lot of energy and try to make sure everyone is having as good a time as we are! We’re playing a launch gig for our debut EP, Four Ways To Cure Teen Angst, on Friday 22nd April at Port of Call in Sunderland, which is shaping up to be a great night! We’ve also got a headline show at O2 Academy 2 in Newcastle this summer (around August time) that we can’t wait for; we’ve got some great bands on board already to play with us which has got us all really excited! A possible UK tour is also in the works too, so keep an eye out for that later this year. Our biggest achievement so far would definitely have to be getting our debut single, France, played on ITV’s This Morning, only a week after it had been released! It gave us some great exposure and something we won’t forget in a hurry! In general the feedback we received from everyone about that song has been overwhelming and totally unexpected. I’d say the biggest challenge that we have faced, and will undoubtedly continue to face, is finding a scene to fit in to! Teenagers come to local gigs, so that’s who we have to appeal to ultimately to gain popularity. Generally we’ve really been taken aback by the sheer amount of positive feedback and support, we thought teenagers would hate happy jazz music! If this EP is met with as much positivity as France, then this challenge becomes astronomically smaller; we sincerely hope that our songs can be as relatable as heavier, more angsty bands. Money is a challenge too, as a band of lazy students, we are broke. That really makes everything a lot harder, especially when we want to do everything independently. We want to stay alive, first and foremost, both as humans and as a band! So many great bands just slowly ebb away and die, or get sucked into playing the same local venues week in, week out. We all have huge plans for where we want this band to go, but they all completely rely on the reaction of audiences to our music, which as I say, so far has been great. We have a lot of demos down for another record, be that a second EP or a full length album, that we are going to record and produce ourselves over the summer. At the minute though we’re really just focusing on releasing this EP and seeing that reactions we get so we can see what our next steps are going to be! We should probably all get decent haircuts too, when we can afford them. Picnic launch their EP at Port of Call, Sunderland on Friday 22nd April.